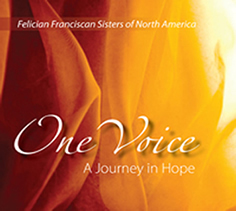 “One Voice – A Journey in Hope” is a musical CD created and produced by the Felician Franciscan Sisters of North America. “One Voice – A Journey in Hope” includes 18 religious selections, several composed by the sisters themselves. The songs express the unity of the sisters as they undergo the process of reconfiguration whereby the eight North American Provinces of the Felician Sisters members will belong to one province by late 2009. The recording of “One Voice – A Journey in Hope” was the inspiration to express the prayerful and faith-filled unity of the process of reconfiguration. Almost 50 Felician Franciscan Sisters, from the current provinces in Canada, Connecticut, Illinois, Michigan, New Jersey, New Mexico, New York and Pennsylvania, gathered in Lodi, New Jersey during Christmas week 2007 to make the recording. Directors of the project were Sister Marilyn Marie Minter, Sister Veronica Marie Lucero and Sister Margaret Marie Padilla. takes us beyond the roads we have known. Listen to a sample of some of the songs.